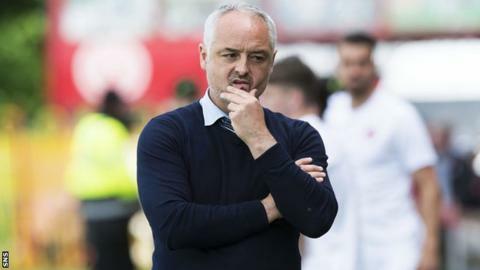 Dundee United boss Ray McKinnon insists his side paid the price for their hectic play-off schedule in Sunday's defeat to Hamilton Accies. A 1-0 second-leg win ensured Accies retained their top-flight status. United had to come through two two-legged ties to reach the final, at which point Hamilton, 11th in the Premiership, entered the play-offs. "The six games has taken its toll - it was an evenly contested game but I felt we ran out of steam," McKinnon said. "I'm not making that an excuse, it's just a fact. You could see the legs were gone in the second half. We didn't have the same intensity to our play or our pressing." McKinnon's side, who finished third in the Championship, overcame Morton 5-1 on aggregate in the play-off quarter-final and beat Falkirk 4-3 on aggregate in the semi-final. But following a 0-0 draw with Hamilton at Tannadice in the final first-leg, Greg Docherty's goal on Sunday was enough to consign United to a first defeat in 12 games and at least another season in the second tier. "We were running on empty and I'm really disappointed for the players because they wanted it so much," McKinnon added. "We came down here with high hopes considering the form we're in, but unfortunately we've just come up short at the final hurdle. "We've been using the same players regularly over the last six to 10 weeks and that's taken its toll today. They've given everything, they tried everything to get back into the game but just didn't have the legs at the end." McKinnon said the staff and players were left "feeling flat" by the result but he is already hopeful that his side will be better equipped for another promotion push next season. "We have to work hard over the close season to identify people we can attract to the club, better quality than what we've got - we need to improve that," he said. "We're going to work hard to put a really good squad together. We've started the recruitment process well with James Keatings and Billy King (already signed). If we can maintain that kind of standard, we'll give ourselves a great chance next season."